I spent a solid week in Silicon Valley and as I wrap up my trip and reflect back on the companies I met with I was pretty happy to see a good deal of optimism from the communications and technology executives I met with. Some areas of growth are the usual spaces such as products which support broadband growth and wireless backhaul. For the companies not in those spaces there seems to be more optimism coming from companies which are not the premium players in their markets. The so-called value players seem to be attracting more interest as budgets have tightened. The highly anticipated news of Nortel's Enterprise Solutions business being sold to either Siemens or Nortel is here. The envelope please... And the winner is... Avaya - subject to bankruptcy bidding rules and court approval of course. While the media business in general has been like so many other industries such as financial and real estate - meaning lots of doom and gloom, I am happy to report TMC is hiring to fill new positions and looking for new people as well. We just hired three new professionals in our sales group and expect to add more people this year. You may recall I mentioned we were looking last month. While print publications have seen advertising decline and we should know as we publish four magazines - we have positioned ourselves for the day when marketing moved to the web since the nineties. I know we are in a recession and everything is supposed to be gloom and doom, etc. but please indulge me as I remind many of you just how important it is in these tough times to get new customers. It is for this reason I feel compelled to remind you ITEXPO has become the world's communications conference - the place you need to go to find new products and services. As a result, vendors/exhibitors were thrilled with ITEXPO in Miami this past January. Attention Developers: You Could Win! There is nothing that builds a resume more like an award and if you are a developer, you definitely want to keep an eye on the new Dialogic Innovator Award contest which will not only give you some great bragging rights, you could win some prizes as well. Dialogic was nice enough to ask me to be one of the judges in fact and I am looking forward to being part of this program. Winners get a free one-year service and support contract, a $5,000 credit towards future Dialogic products, t-shirts, press releases and an Innovator logo which I imagine can be invaluable in boosting a company's marketing efforts. Sure it isn't a $75,000 motorcycle - which makes a great gift for your favorite blogger by the way, but hey, times are tough. Will Google Wave Transform Communications? Google Wave is an ambitious project from Google which allows true real-time communications by integrating chat, email, a wiki, social networking tools and more. In many ways it competes with other services such as Facebook and as such it really isn't that new. Still, it does seem slicker and it is more open than many other services which provide communications solutions (a promotional plug -- you may want to check out TMCnet's newest news-driven Global Online Community called Communications Solutions). It also allows real-time IM sessions meaning you can see what the other person is typing before they hit enter. On a recent flight back from Europe I marveled at the ice littering the North Atlantic. A flight attendant told me it was sad as what appeared to be ice cubes from a mile or more in the air used to be icebergs. I am concerned about the environment but I am not sure I agree with the carbon cap and trade system being proposed in the US as it could adversely impact the economy. But last I checked, regulation gets passed without my express permission and in a world where CO2 is becoming a pollutant, you need to be more aware of energy use and carbon emissions than ever before. 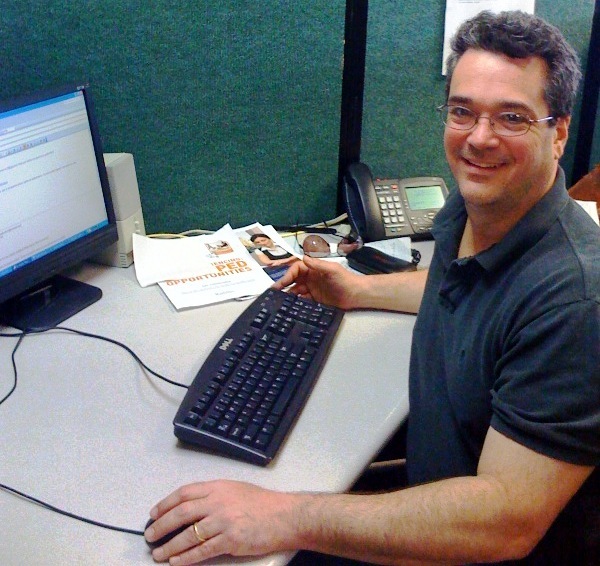 For nearly 13 years, Greg Galitzine has been a tremendously valuable part of the TMC team. His career started as an editor for CTI Magazine in 1996. Where he reported on the collision of the computer and communications spaces including what we called IP telephony back in the day. In 1997 we convened a meeting with Greg to explore whether it made sense to launch a publication in the IP telephony space. If you look at TMC from the outside and find yourself asking how you can get a job as an intern at this global integrated media company which builds communities online, in print and in person while gaining marketshare regardless of economic climate, I have some great news to share. We are looking for a small army of interns who want to learn what it's like to take on major multibillion dollar media companies with infinite resources and consistently win. We will teach you how to sell collaboratively - how to listen and to be loved by your customers (well most of them anyway). We will teach you integrated marketing and online marketing - not theory but ever-evolving practice. I would like to welcome back Patrick Barnard to the TMC editorial team. Patrick has covered a number of different editorial areas at TMC over the years and recently left TMC to work on Multichannel Merchant. He is now back and his return is just a continuing reinforcement of how TMC is continually investing in its editorial talent -- just as we are constantly evolving our web technology, graphics, analytics, reporting and more. Thanks to influential readers like you TMC has been blessed with hundreds of advertisers and exhibitors each year who partner with TMC to grow -- even in the face of challenging economic conditions. We take sponsor and reader loyalty seriously -- looking to constantly improve to provide you with the best products we can.